I’m celebrating 15 years of being my Beloved’s wife today! Sometimes when I think of that number I’m surprised by how fast the years have gone by, and then other times it seems like we’ve been married much longer based on how my heart feels as if he’s always been a part of me. 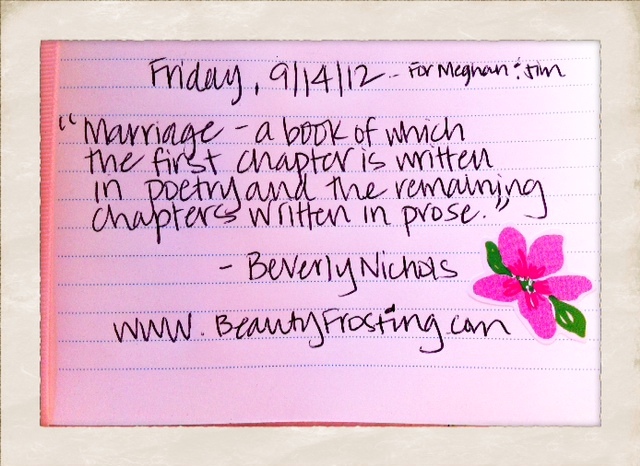 When I think back to my wedding day it was filled with such hope and promises. A new love was blossoming and a new life was beginning. If you’re a wife today, I’m sure you can relate to the romantic nostalgia. But the reality of the last 15 years is that it has been extremely painful. Now, I’m not meaning my marital relationship, but rather our life’s circumstances. Through these circumstances though, God has taught me many things as a wife and I’d love to share them with you in hopes that it’ll help your marriage! As a Godly wife, I needed a boatload of trust in the Lord for all aspects of my life. As a Godly wife, I needed to put my faith in Christ to be my provider rather than my husband. Since I’m married to a self-employed man sometimes throughout our marriage his job status has changed to being an unemployed, self-employed man! As a Godly wife, I needed the Lord to calm my anxious heart and meet me where I was when my Beloved, a mere human, wasn’t capable of meeting all my needs. As a Godly wife, I needed to be filled with God’s overflowing grace so I could pour that same grace into my man, otherwise I’d have a crack in my marital foundation…and just a tiny sliver is enough room for the Enemy to squeeze into and wreak havoc in my marriage. As a Godly wife, I needed to encourage my man and become the Good Samaritan Wife to him when the world knocked him down. As a Godly wife, I found that when I became my husband’s biggest cheerleader, he became mine. As a Godly wife I had no idea how much I’d have to die to self in my marriage….and how much I’d enjoy dark chocolate as a result of this! No, honestly, I didn’t realize how much this obedience to Christ would produce such sweet fruit in my marriage. It’s all worth it, dear friend. As a Godly wife I learned I didn’t have to carry all of the responsibilities of our family and finances on my shoulders. Although I didn’t fully understand why God made husbands as the head of the home when I was a new Believer and then a new bride, I fully see the benefits of this God-ordained headship today. It’s a wonderful blessing the way God set this marriage thing up! As a Godly wife I needed to make sure that my mothering did not take precedence over my marriage. As a Godly wife I needed to learn that extended family and friends did not come before my marital relationship, therefore, we put hedges up around our marriage to protect us from this outside influence. As a Godly wife I needed to learn that my husband is drawn to me when I’m vulnerable, transparent, humble, caring, forgiving, gracious and kind, rather than when I’m prideful, impatient, snappy, argumentative, contentious, and withdrawn. I want my husband drawn to me. As a Godly wife I needed to learn that my marriage was designed to bring God glory as well as to make me holy. This puts all of my hardships, trials, and heartaches into perspective! As a Godly wife, my marriage is not about me, it’s about the Lord! My Father has taught me that my life’s circumstances shouldn’t dictate my character nor should it dictate the strength, love, and passion that I want my marriage to be. I get to make this decision being that I have control over myself! Now you might be wondering why I used the term ‘Godly wife’? Well, because we have a purpose as God’s daughters. Any woman can get married and be some man’s wife. But a Godly wife is not the bride to just one man, but to Two; Jesus being the other! You and I not only bear our husband’s last name, but we bear the name of our Maker every single day of our lives. This is what sets us apart from the wives of this world. We need to look different and therefore, when we look different, our marriages will look different. Our God-fearing marriages will naturally represent the Bridegroom, which is Christ. This is the type of marriage I’ll continue to strive for until the day I die or until the Lord takes my Beloved home. But until that time comes, I’ve got God’s Kingdom to build and it all starts with my marriage! Let’s be co-laborers in the faith together. Go build up your marriage as well! As a Godly wife, you are more valuable than rubies!